Payrolls were up 103,000 last month, well below expectations for about 180,000, but this miss should not be taken to mean that the job market is in trouble. To the contrary, the trend of job growth remains strong and unemployment is at a 17-year low. Remember, these monthly data are noisy and you must average over numerous months to extract a meaningful trend—see "smoother" figure below. 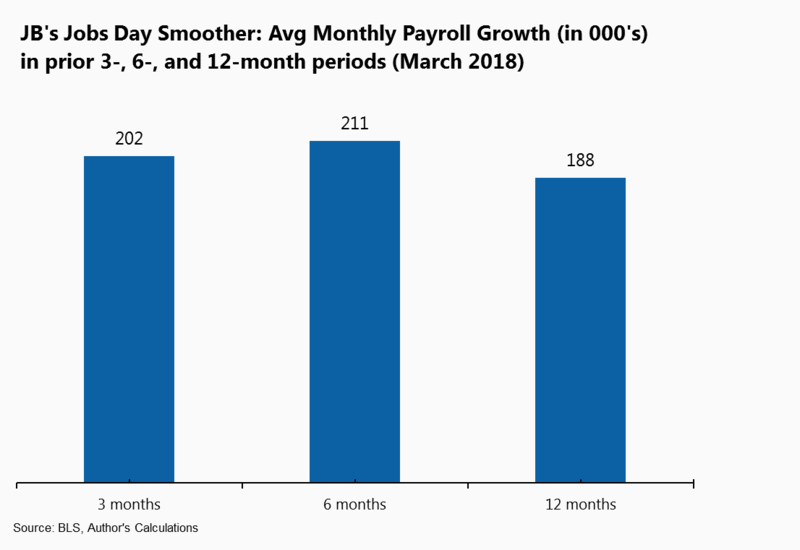 Consider, for an example of the monthly swings in these data, February's gain, revised up now to 326,000 (the larger downward revision to January led to a decline of 50,000 from the combined previous reports of job gains in those months). But the key words there are "closing in." The employment rate of prime-age workers (25-54) still implies room-to-run (as does the lack of pressure from price measures, including inflation and wages). The peak in the prime-age rate was 80.3% in January 2007; its trough in 2011 was 74.8%, an historically sharp decline as these workers got seriously slammed by the Great Recession. But the persistently tight job market is enabling them to claw back their losses, against many predictions that they were lost forever (a reminder to economists that it's tough in this space to know what's cyclical and what's structural). This month, we (Lexin Cai and I) dig a bit deeper into the wage story. Much wonkiness follows, but the punchline is that slow productivity growth poses a clear constraint on wage growth. However, there's a lot more room for wage growth through labor clawing back some of its lost share of national income. Importantly, from the Fed's perspective, that's source of wage growth is non-inflationary. But, as the scatterplot below shows, they've essentially plateaued at that level, which the figure reveals to be somewhat unusual. 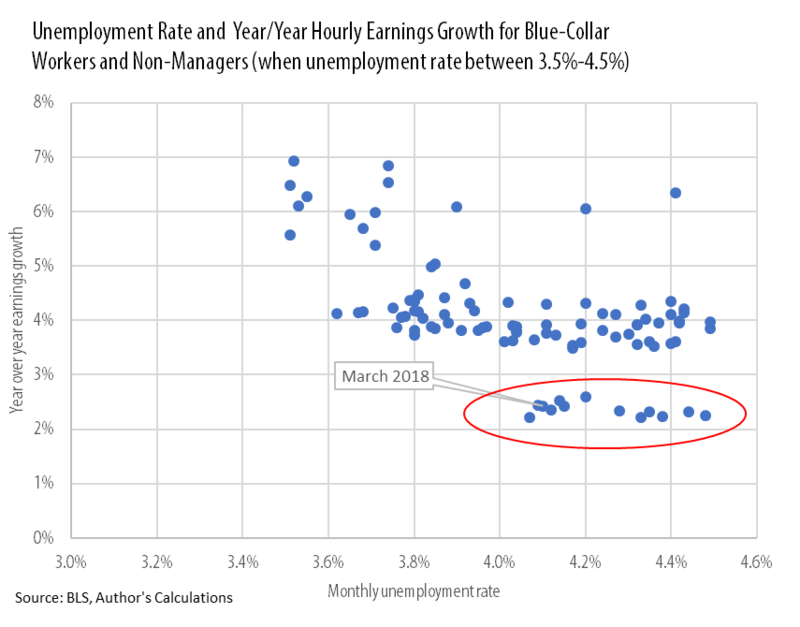 The figure plots yearly, nominal wage growth for blue-collar, non-supervisory workers (this data series goes back to 1964, far enough to enable this analysis) in every month that the unemployment rate was between 3.5-4.5 percent. 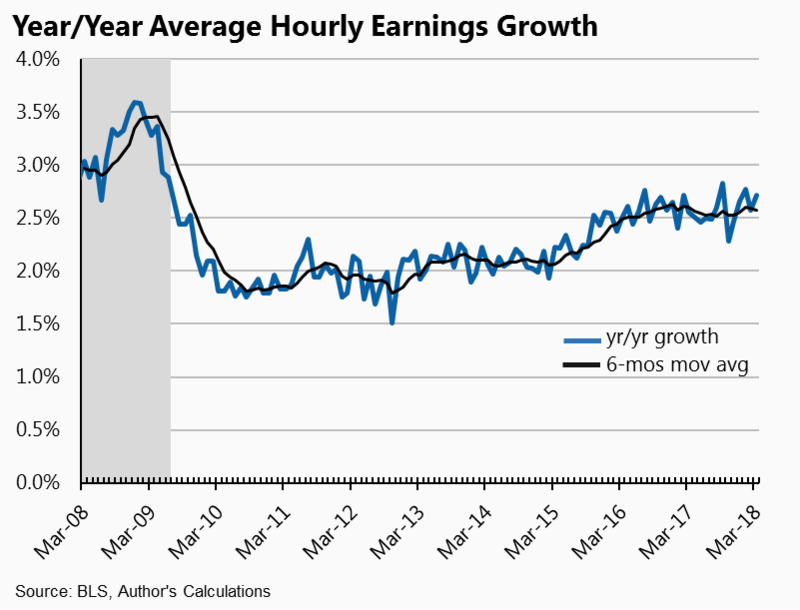 The average wage growth in these months was about 4%, but as you see in the cluster we've circled, all the recent observations have been significantly lower than that, at around 2-2.5%. First, there's a bit of apples-to-oranges in this comparison. The demographics of the workforce, inflation, and most importantly, productivity growth–all of which influence wage growth–have all changed a lot over these years, such that even conditional on low unemployment, we'd expect different outcomes. I don't think changing demographics is much of a determinant of this outcome. 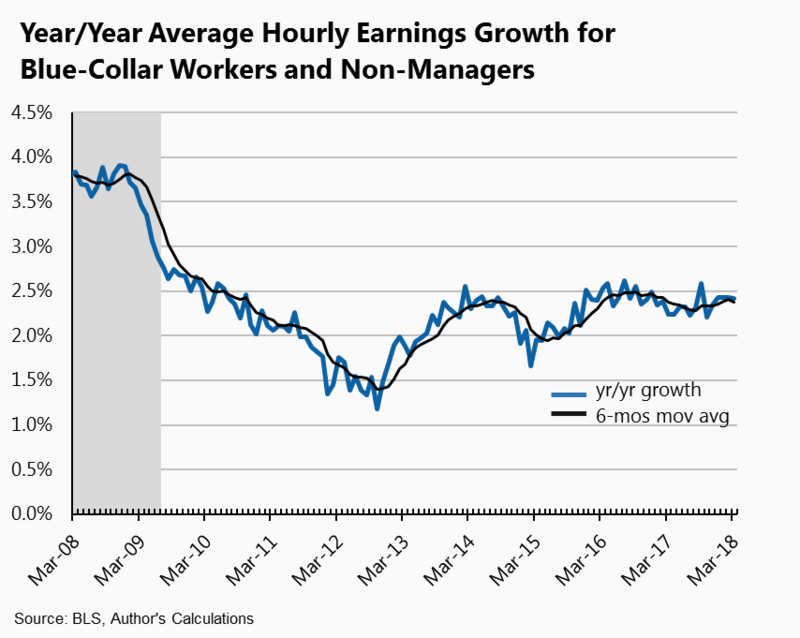 To some extent, pulling less skilled people into the job market may be putting some downward pressure on wage growth, but I'm sure low inflation and especially our current slow productivity growth are more consequential. The middle cluster partially reflects the strong wage growth of the full-employment latter 1990s, when much strong productivity growth (2.5% versus today's 1%) helped pay for non-inflationary wage growth while enabling firms to maintain high profit margins. The bottom cluster—the one we're currently living through—reflects both low inflation and low productivity. We don't know much about how to get faster productivity growth, but there's another path toward wage gains for these workers: redistribution from the inflated profit share of national income to the labor share. Under that scenario, very tight labor markets—I'm talking about the left side of this scatterplot—create the pressure for faster wage gains that shift income from profits to wages. Yes, that crimps corporate profit margins and the stock market will hate it. But it is precisely the rebalancing that should occur in a truly full employment labor market. In fact, the absence of such a rebalancing is one signal that we're not yet at full employment.